Together for Humanity offers resources and workshops for students and teachers. Your students will be able to join the 75,000 students who have enjoyed and benefited from our programs. Thanks to generous funding from the Department of Social Services, we are offering all our school programs absolutely FREE during 2017. Together for Humanity is now offering six programs for schools. All programs are run by our teams of Muslim, Jewish and Christian presenters, and we also have Indigenous presenters available. This workshop is a one-hour interactive presentation that supports and enriches the NSW syllabus. This workshop engages students in exploring common and diverse celebrations of significance in Australia and the world. Our Muslim, Jewish and Christian presenters share stories of their own celebrations and challenge assumptions. Programs suitable for years 3-4. 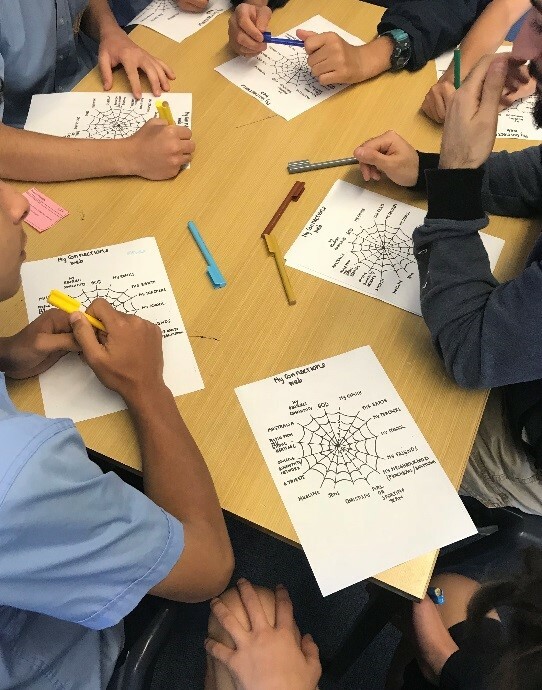 For Stage 3 History: Australia as a nation and Geography: a diverse and connected world. In this workshop students hear stories relating to how migrants have contributed to Australian society. Our presenters lead students on an exploration of similarities, differences and relationships between people, places, cultures, customs and beliefs, perceptions and the importance of intercultural understanding. Program suitable for Years 5-10. Assembly style, suitable for up to 150 students. Expands cross cultural understanding, develops appreciation of similarity and difference. Builds real relationships across cultural and religious difference. Our signature presentation where students learn about diversity, commonality and question assumptions about identity. A diverse group of 3-4 presenters engage with students to unpack the issues of diversity over a one-hour presentation. Programs suitable for years 3-10. The Reaching Out program offers a more in-depth experience. Our diverse facilitators challenge and support your students to work with their peers from other schools with backgrounds different from their own. Two or more schools will come together for a minimum of one day once a term for three to four terms, to learn more about diversity. Includes storytelling, values clarification, role play and problem solving. Expands cross cultural understanding, develops citizenship and communal responsibility. Option to do joint service project, with ongoing support from Together for Humanity. Evaluation of our Programs Our Outside the Box and Reaching Out programs have been found to be “educationally effective” – Dr J NAYLER, Independent Evaluation Report, 2009. Read the summary or detailed report. Together for Humanity presentations to principals and teachers are available to demonstrate our approach, and to contribute to staff competency regarding intercultural understanding. Knowing who you are, where you come from, what you believe in, what you strive for and what kind of world you want to contribute to is the foundation of standing your ground. The Belonging and Identity program has been created for students from marginalised, disadvantaged, low Socio-Economic Status(SES) and/or isolated communities. Addressing the needs of students who experience social and peer pressures, traumatic backgrounds, immigration, being a minority, or discrimination. Program suitable for Years 6-10, in a group size of up to 20. Offers a balance of relationship building and far reaching examination of important issues such as prejudice, identity, conflict, purpose and engagement. Minimum of three 1.5 hour workshops. Please register your interest for a workshop by completing the form or contact us. Invite Us To Your School !